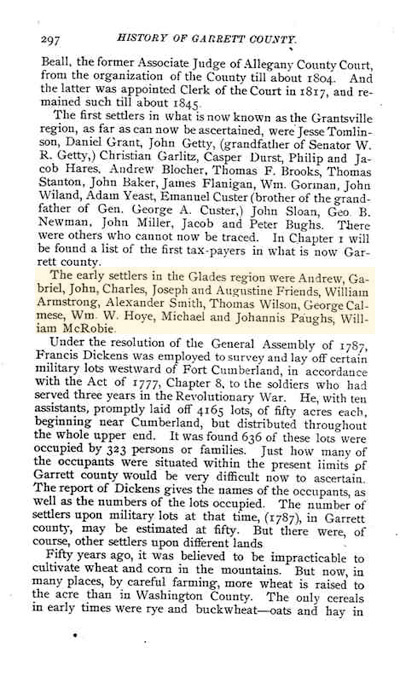 History of Garrett County, page 297. William McRobie is listed as one of the earliest settles of the Glades region. Someone, somewhere, once sent me a map outlying exactly the tract of land that William originally settled. In my efforts to organize my research, of course I misplaced it. So if anyone out there has a copy, I would really appreciate it if you could send it my way! Records before 1800 are hard to come by for most countries online, but every once in awhile I check out all the usual sites to see if they’ve added any new information. My most recent search of FamilySearch; yielded some interesting and potentially plausible results. Here are a few entries for William McRobie (or variations on the surname) in Scotland Births and Baptisms, 1564-1950, around the year 1761. This is where the first of many assumptions starts. It has been family legend that our branch of the McRobie tree hails from Aberdeen. So assuming that William was born in Scotland, his would seem to disqualify all but the second and fourth option. Except for the fact that the town of Banff actually resides in the county of Aberdeenshire, so I’m still keeping it in contention. For now, I’m semi-disqualifying the third option from Perth. I say semi, because I don’t want to rule it out completely. Obviously, the two most likely choices are the first two, since they are from the correct year. For the time being, I’m actually leaning towards the first option instead of the second. No particular reason other than a gut feeling. If anyone has any further information that can confirm or deny any facts in any way, please email me at McRobieFamilyTree@gmail.com. to see what you can find. It is a free site – you just need to register to use it. I had great luck find Md land records for our Casteel line.